This post is about a prime example of how companies can use social media tools to improve their products and services. You would expect this from a company looking to make a name for itself in social media, as Yammer is. If social media is your core product, you should be out there listening and participating in discussions related to your company. But by actually following through on this philosophy, and listening to your users, you can identify and solve the problems you didn’t know were problems. As SMUGgles know, I like Yammer a lot, and have been experimenting with it. I’ve even started a Yammer curriculum in this university. In a recent post, Yammer 104: Yammer as GTD Reference File, I wrote about how Yammer can be used as the place where you do brain dumps…a repository of thoughts and links that is useful for individuals, but becomes exponentially more powerful as groups pool their resources. If even one person finds Yammer helpful as a personal repository (much as I have with this blog as a personal GTD general reference file), that makes it worthwhile, especially since it’s free to start. That’s certainly the case for me. I blog as frequently and effortlessly as most anyone, but there’s no comparison in effort between writing a blog post and Twittering or Yammering. In my blog I feel a certain need to self-edit and polish my writing, because it’s in essence my “brand” to the world. Anyway, in my Yammer 104 course I remarked how useful Yammer can be for cataloging general reference information, but lamented that it isn’t quite as useful as a blog because you have to search on tags. And that, of course, depends on people thinking to use the # sign to denote important terms. Searching by tags always works. It would be ideal if we didn’t have to tag and could do full-text search, but I have tried several time(s) and get no results. So I tried it…and now it worked! 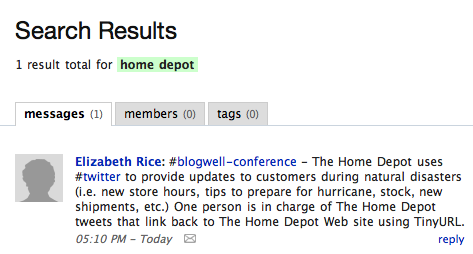 Any of us who recall seeing something about the Home Depot in our Yammer stream can do a search and find this post quickly. We don’t have to remember that it was at the #blogwell-conference, and we also don’t have to sort through many Yammers that might have a #twitter tag. We also could have searched on “hurricane” or “natural disaster” and found it. This makes Yammer much more useful, because we don’t need to remember to tag everything. As you see in my Yammer 104 post, I was excessively tagging because it was the only way to find things. That made for a lot of extra # signs #messing-up the #posts. As important as the enhanced search feature is, the fact that it demonstrates listening is even more crucial. Two different Yammer employees had participated in the conversation. I think Adam thought he was correcting me. Full-text search was a feature they thought they had as part of the service. He was trying to set the record straight. But as they continued to discuss, they discovered that somehow the feature they thought they had wasn’t working. And they fixed it. So if you haven’t tried Yammer, check it out. And if you want to learn more about GTD and how it took my email inbox from 11,000 to fairly consistently empty, check here. Tools like Yammer can help you accomplish this, too, because you can read your Yammer emails (if you choose to receive them) and delete. You don’t need to keep the message in your email system (and neither do dozens or hundreds of your colleagues) because you know it’s housed in Yammer. And you can find it through full-text search, not just searching by tags! It will be interesting to see how full-text search scales for Yammer, and whether the full-text search will be rapid enough when a company has potentially thousands of Yammerers and maybe a million posts to search. But if the company’s performance in that matches what I’ve seen in responsiveness on this bug fix over the last few days, I think they’ll handle it well. This is great stuff, and I just got some inspiration for using Yammer. We have been testing it at Inman News, and I think that it might come in ultra-handy when some of us are at the upcoming National Association of REALTORS Conference and Expo. We can send live, on the ground info to the team back at HQ. They can act on it, immediately. That rocks! I’m also speaking before the Realty Alliance, a group of independent real estate brokerages, big and small. I have already planned on talking about Yammer, and this is just icing on the cake. That’s great to hear, Daniel. I’m glad this is useful for you. I’m all about inspiring people to try using new tools in creative ways. And from what I’ve read, there are a lot more great features in the pipeline that will be going live fairly soon. Yammer is like a private Twitter. Lots of what I say, I’m happy for the world to see. But other things are more proprietary. It’s nice to have a micro-blogging platform that meets those need.